If there’s one thing I can be sure of in my mum life, it’s that there will ALWAYS be MAGGI 2 Minute Noodles in my pantry. MAGGI instant noodles can morph from a fun snack to a delicious quick noodle meal in just a few steps. And you don’t need to look far beyond the contents of your fridge to make something the kids will love. Use your favourite vegetables and a lean protein such as cooked chicken, beef or even prawns to boost your noodle bowl. 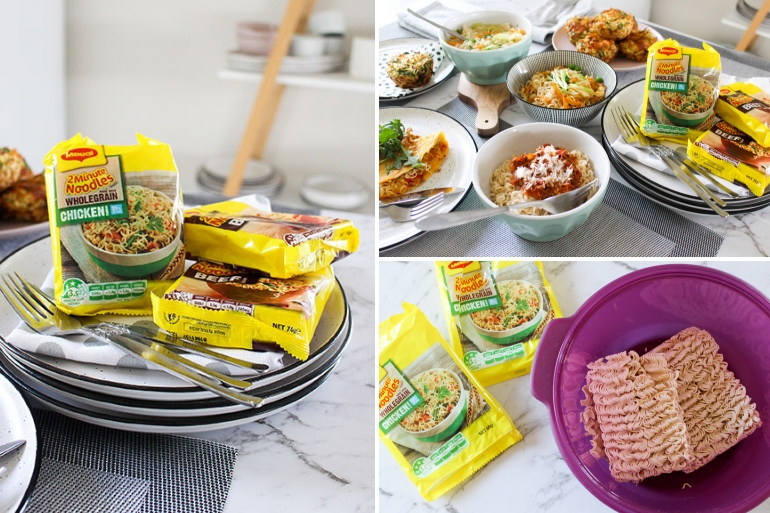 My kids love MAGGI 2 Minute Noodles and I love them too because they’re ready to eat in just minutes. They’re an inexpensive pantry staple and need just a quick whiz around the microwave (or a few minutes on the stovetop) to give the perfect base for a quick-sticks meal. Noodle flavours include Chicken, Beef or Oriental, as well as the tasty Fusian range. 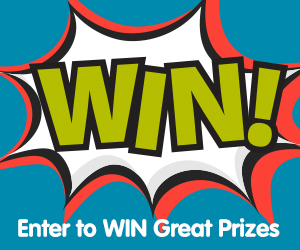 Watch as we work our magic below – Recipes follow. 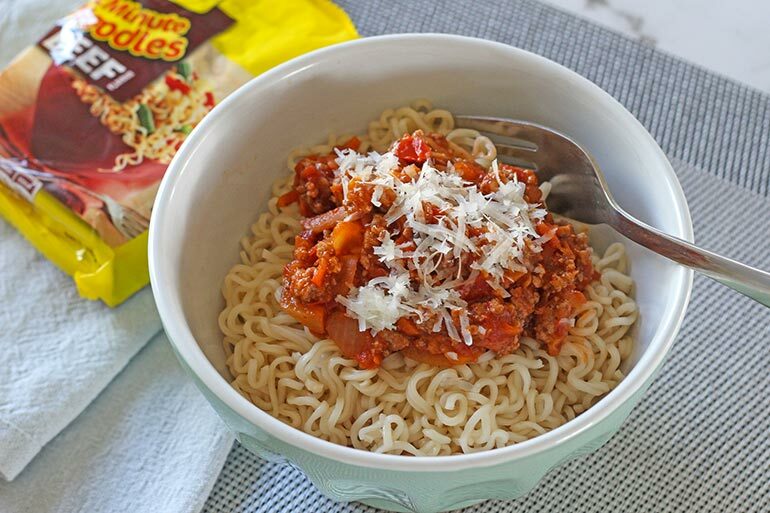 MAGGI 2 Minute Noodles to the dinner time rescue! 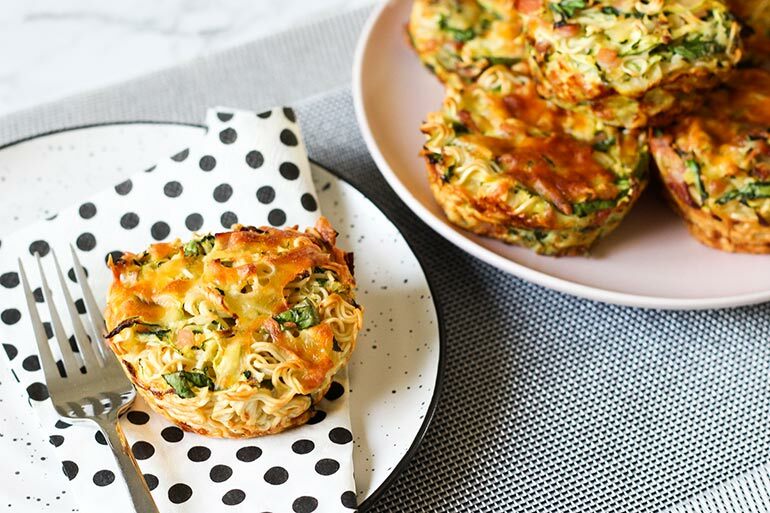 These noodle quiche cups are perfect for breakfast, lunch and dinner or as a delicious after sports training snack. Bursting with flavour, this recipe is also a great way to use up those veggie odds and ends in the fridge AND the kids love crunchy noodles and cheese quiche tops! Preheat the oven to 180C. Spray a 6-capacity Texas muffin pan with olive oil. Break up the noodles and cook as per the packet instructions, saving the flavour sachet for later. Drain and rinse under cold water. Set the noodles aside. In a large bowl combine the reserved chicken noodle flavour sachets, zucchini, onion, spinach leaves, eggs, sour cream, bacon and half of the grated cheese. Season with salt and pepper and mix thoroughly. Fill each muffin cavity with the mixture and top with the remaining cheese. Cook for 30 minutes or until set. Rest in the pan for five minutes before gently levering out with a silicone spatula. A super easy way to use up leftover bolognese sauce, simply add to delicious beef noodles for a fun and extremely quick spaghetti meal! If you don’t have leftovers, make this quick sauce and freeze it into 4 individual portions. In a small saucepan or frying pan, heat the olive oil over medium heat. Cook the onion and mince until browned. Add the carrot, cook for a minute, followed by the passata. Let simmer until thick and heated through. Cook the beef noodles as per packet instructions, drain. Serve the noodles in a bowl, topped with one portion of the bolognese sauce and a sprinkling of cheese. Yum! 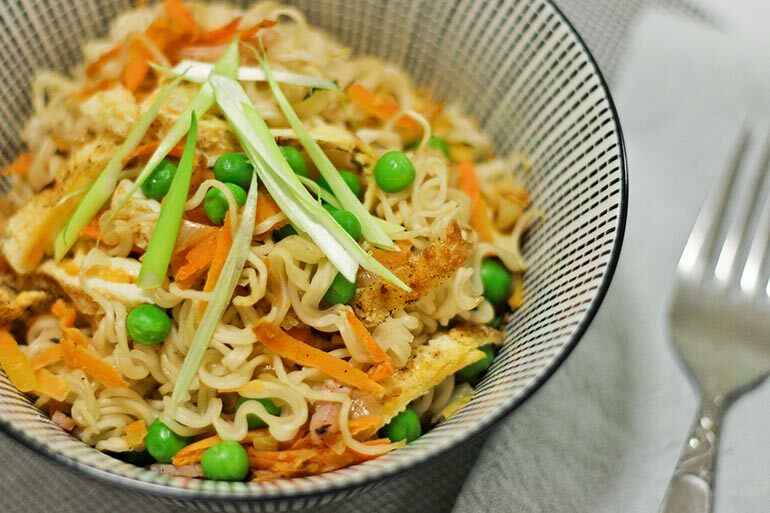 A fun take on an old eggy favourite and a meal in itself when filled with delicious noodles and vegetables. Break up the noodles and cook as per packet instructions, drain. Heat the oil in a small non-stick frying pan over medium low heat. Add the drained noodles to the pan and mix through the vegetables. Spread the noodle and veg mix evenly over the pan and gently pour the eggs over the top. Season with salt and pepper, cook until the egg is just set. Carefully fold omelette in the middle, slide onto a plate and serve with salad leaves – or eat as is! The ultimate quick-sticks chicken noodle soup, just the ticket for when someone is feeling unwell or needs a belly-warming meal. In a small saucepan or microwave, combine 300ml of boiling water, the carrot, celery, chicken, chicken flavour sachet and cook for 2 to 3 minutes. 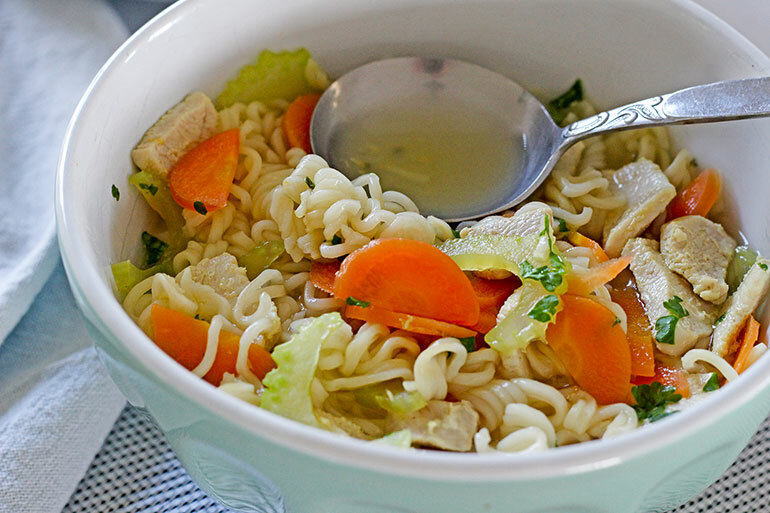 Break up the noodles, adding them to the saucepan and cook for two minutes. Coming together in next to no time, this recipe is Just like fried rice – ONLY WITH ALL THE FUN OF NOODLES. My kids love bacon (and who doesn’t! ), but you can also switch it for shredded chicken or cooked prawns for a bowl packed full of flavour! Cook noodles as per packet instructions, drain and set aside. Fry bacon, onion, carrot and frozen peas. Cook and slice a one egg omelette, set aside. Add the drained noodles to the pan, splash with MAGGI seasoning (delicious! ), mixing thoroughly. Top with spring onions and tuck in straight away. 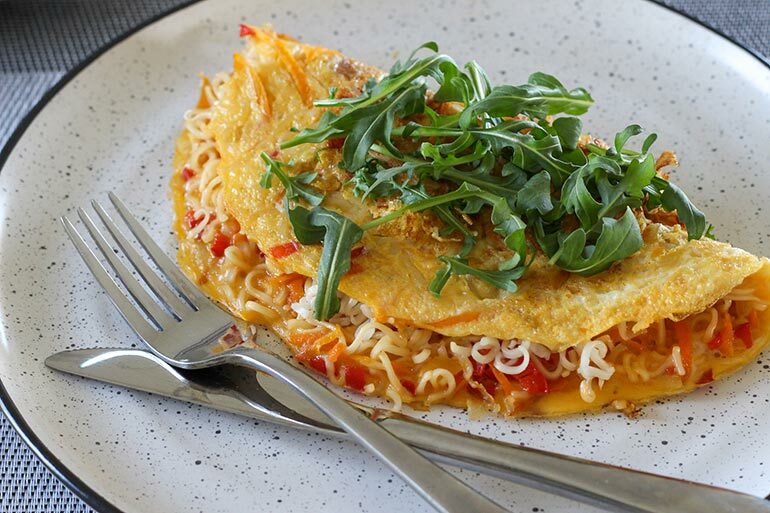 As you can see, it’s SO EASY to whip up a quick, filling meal using MAGGI 2 minute noodles and a handful of extra ingredients! 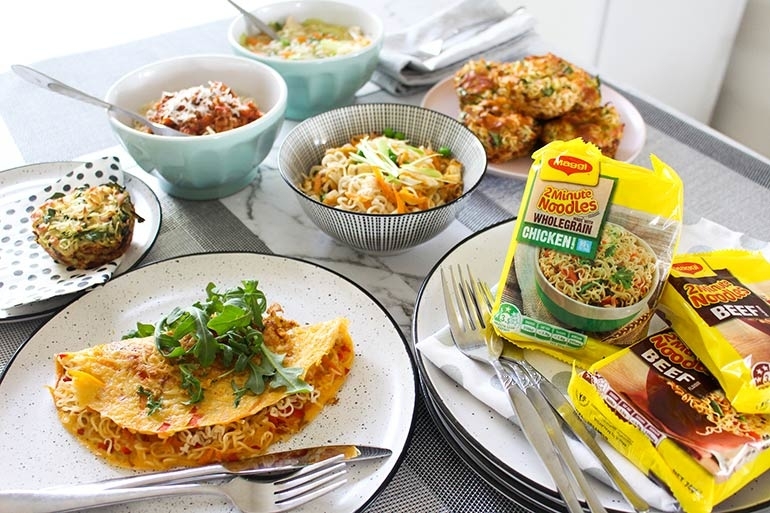 For even more MAGGI 2 Minute Noodles dinner inspo, there’s a buffet of delicious recipes waiting for you over at MAGGI. This is a sponsored article for MAGGI.